The growth in the amount of CO2 in the Earth’s atmosphere has been slowed by the increased ability of plants to soak up the gas. A new study says that green vegetation has helped offset a large fraction of human related carbon emissions between 2002 and 2014. Plants and trees have become more absorbent say the authors, because of so much extra CO2 in the atmosphere. The slowdown, though, can’t keep pace with the overall scale of emissions. Over the past 50 years, the amount of CO2 absorbed by the Earth’s oceans, plants and vegetation has doubled and these carbon sinks now account for about 45% of the gas emitted each year because of human activities. Researchers now report that since the start of the 21st century there has been a significant change in the amount of carbon dioxide taken up by the plants and trees. The new analysis suggests that between 2002 and 2014 the amount of human caused CO2 remaining in the atmosphere declined by around 20%. Reports earlier this year indicated that there has been an increase in the number of trees and plants growing on the Earth, the so-called greening of the planet. But the authors of this new study believe that this isn’t the main cause of the slowdown in the rise of CO2. Image copyright BERKELEY LAB Image caption The black line is the observed growth rate and the beige line is the modelled rate. The blue line indicates no increasing trend between 2002 and 2014. “There have been reports of the greening of the land surface but what we found was that was of secondary importance to the direct effect of CO2 fertilisation on the plants that are already there,” lead author Dr Trevor Keenan told BBC News. Another important element in the story is the impact of a hiatus in global temperature increases on the behaviour of plants. Between 1998 and 2012 temperatures went up by less than in previous decades. This has impacted the respiration of vegetation. “The soils and ecosystem are respiring so as temperatures increase they respire more, releasing more CO2 into the atmosphere,” said Dr Keenan. One consequence of a warming world that has been expected to increase was the number of droughts around the world. However, this new study suggests that, on a global scale, there has been little or no change in the prevalence of drought over recent decades. Overall though the slowdown caused by vegetation hasn’t stemmed the total rise of carbon which has now passed the symbolically important level of 400 parts per million (ppm) in the atmosphere. “This study highlights just how sensitive the natural environment is to a changing climate and how important it is to protect natural vegetation so it continues to absorb part of our carbon emissions,” said Prof Corinne Le Quéré, director of the Tyndall Centre at the University of East Anglia, who wasn’t involved in the study. One of the big lessons from the new report is that land carbon sinks are not set in stone and do have the potential to change over time. If they could be managed properly, it might help some countries to cut their emissions and limit climate change. The authors of the study say that the pause in the growth of atmospheric carbon will almost certainly be a temporary phenomenon. As temperatures rise, these green sinks could in fact become sources of CO2. “Now we are seeing plants slow down the rate of climate change,” said Dr Keenan. “But if we are not careful and we don’t do anything about climate change all that CO2 could be put back in the atmosphere later and that would really accelerate the rate of warming. The annual growth rate of atmospheric carbon dioxide measured at the Mauna Loa Observatory in Hawaii jumped by 3.05 parts per million during 2015, the largest year-to-year increase in 56 years of research, according to the U.S. National Oceanic and Atmospheric Administration (NOAA). The development is significant because Mauna Loa Observatory is the oldest continuous atmospheric measurement station in the world and is widely regarded as a benchmark site in the World Meteorological Organization’s Global Atmosphere Watch network. WMO will issue its own report on greenhouse gas concentrations in 2015 later this year, based on data from 50 countries, including stations high in the Alps, Andes and Himalayas, as well as in the Arctic, Antarctic and in the far South Pacific. In January and February 2016, the monthly average concentration of CO₂ across the globe (not just Mauna Loa) passed the symbolic benchmark of 400 parts per million. In February, the level was 402.59 ppm, according to NOAA. The jump in CO₂ is partially due to the current El Niño weather pattern, as forests, plant life and other terrestrial systems responded to changes in weather, precipitation and drought, according to NOAA. The largest previous increase occurred in 1998, also a strong El Niño year. “This should serve as a wake-up call to governments about the need to sign the Paris Climate Agreement and to take urgent action to make the cuts in CO₂ emissions necessary to keep global temperature rises to well below 2°C,” he said. CO₂ remains in the atmosphere even for tens of thousands of years, trapping heat and causing Earth to warm further. Its lifespan in the oceans is even longer. It is the single most important greenhouse gas emitted by human activities. Concentrations of CO₂ are subject to seasonal and regional fluctuations. The seasonal maximum usually occurs early in the Northern hemisphere spring before vegetation growth absorbs CO₂. Levels are lower for the rest of the year. 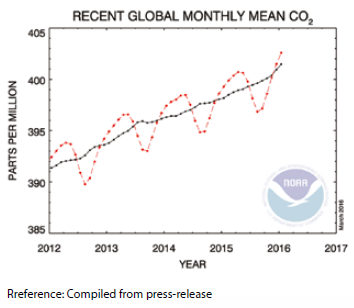 The amount of CO₂ in the atmosphere has increased on average by 2 ppm per year for the past 10 years, reaching new record levels every year, according to WMO’s annual Greenhouse Gas Bulletin. The next Bulletin, based on observations from around the world, will be published in November 2016. The Global Atmosphere Watch network spans more than 50 countries. All stations are situated in unpolluted locations. Giant icebergs could be responsible for the processes that absorb up to 20% of the carbon in the Southern Ocean’s carbon cycle, a study suggests. Researchers say meltwater from these vast blocks of ice release nutrients into the surrounding waters, triggering plankton blooms that absorb the carbon. Described as the first study of its kind, the authors examined satellite data between 2003 and 2013. The results have been published in the journal Nature Geoscience. A team of scientists gathered data from 175 satellite images that tracked the passage of 17 giant icebergs (measuring more than 18km/11 miles in length) through the open waters of the ocean surrounding Antarctica. Co-author Grant Bigg from the University of Sheffield, UK, said the results showed that giant icebergs had “much bigger plumes of phytoplankton (microscopic plant-like free-floating organisms) production in the ocean as a result of fertilisation by the iron that is in the meltwater… than we had previously expected. “This means that the role of giant icebergs in the Southern Ocean carbon cycle is bigger than we had previously suspected,” Prof Bigg told BBC News. When there is an increase in the availability of nutrients in the water, there is a corresponding increase in phytoplankton production. These tiny organisms behave in a similar manner to plants on land, meaning that in order to obtain the necessary energy to grow and reproduce, they undergo a process of photosynthesis, which includes the absorption of carbon dioxide. When the phytoplankton dies, it sinks to the ocean floor, locking away the carbon it had absorbed. Prof Bigg explained that about 3,000 giant icebergs were present in the Southern Ocean at any one time, allowing the team to calculate how much carbon was being locked away in the depths of the ocean as a result of the plankton blooms triggered by the nutrient-rich meltwater from giant icebergs. “We estimate that giant icebergs account for between 10% and 20% of the actual vertical rate of carbon going from the surface to the deep (Southern) Ocean,” he suggested. Plankton scientist Dr Richard Kirby, who was not involved in this study, observed: “The phytoplankton at the sunlit surface of the sea has played a central role in the sequestration of carbon over millennia to affect the atmospheric concentration of this greenhouse gas, and so the Earth’s climate. Hong Kong has set an ‘aggressive’ carbon emission reduction target, claims Environment Sec. Hong Kong has set an “aggressive” carbon emission reduction target of 50 percent to 60 percent by 2020, Secretary for Environment Wong Kam-sing claimed after attending the 2015 United Nations Climate Change Conference (COP21) in Paris. “I understand that this week’s Climate Change Conference is a crucial moment, and of course Hong Kong is concerned about this issue [of climate change]. I also hope that there would be a positive outcome at the conference,” Wong told the media after returning from COP21 in Paris on Thursday morning. At the COP21 Summit, Wong has also said that Hong Kong is aiming to become a low-carbon liveable city, and that there is a new target to reduce the city’s energy intensity by 40 percent by 2025. On Wednesday, Wong was criticised by an NGO delegate from Hong Kong for focusing merely on the city’s past actions rather than speaking about future plans. “All the leaders were talking about future pledges. But nothing of that sort came out of Wong,” CEO of CarbonCare Asia Albert Lai told RTHK. Wong refused to comment on whether the Environment Bureau will ask the two major power companies to reduce the electricity fees, saying that it will be announced in due course. Earlier, it was reported that CLP Power Hong Kong Limited (CLP) and The Hong Kong Electric Company Limited have overcharged for electricity and fuel costs to the tune of nearly HK$5.7 billion. When it comes to climate change, carbon pollution and the like, you are being conned. Carbon and carbon dioxide are not pollutants; they are the daily support of life on this planet. Carbon dioxide, via photosynthesis, is the earth’s major plant food. More carbon dioxide means more trees and more food. Unelected bureaucrats at the European Union and United Nations, in their efforts to demonise and reduce carbon dioxide, promoted diesel cars across the EU zone to meet carbon emission targets. It was successful in reducing carbon dioxide by 15 per cent. The bankrupt EU then boasted to the world how “environmentally friendly” it was. However, this EU/UN effort to reduce carbon emissions made things much worse for humans and the environment. Cancerous nitrogen dioxide emissions increased over 150 per cent and particulate matter increased by over 300 per cent. To improve air quality and health in Hong Kong and the rest of China, all efforts need to be geared at reducing criteria air pollutants, namely: carbon monoxide, lead, nitrogen dioxide, ozone, particulate matter (both PM2.5 and PM10), and sulfur dioxide. When it comes to global warming, the EU and UN are up to their old tricks again, ignoring 4.53 billion years of evidence that the climate is driven by solar activity and not by carbon emissions. They are brainwashing people into believing carbon dioxide is bad when in reality carbon dioxide is good, as it provides more food, via photosynthesis, to feed a growing population. Reducing carbon dioxide will not improve air quality; reducing criteria air pollutants will.